The challenge of a technical climb associated with navigating the crevasse above a dynamic glacial mass. The solitude of getting off the beaten path. Recuperating in the famous Papallacta thermal springs. 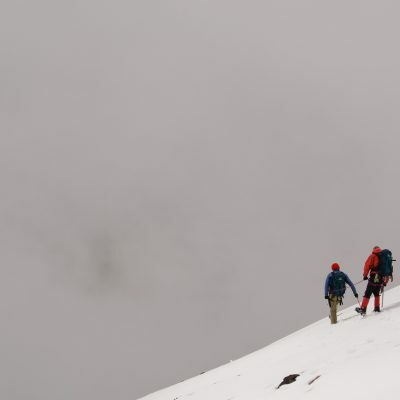 There are few climbers that have summitted Antisana (5758 m/ 18,891 ft), due to the previous access limitations and more rigorous technical requirements. This volcano is ideal for mountain climbers that want to challenge themselves with a technical ascent and revels in the solitude one gets while off the beaten path. Those that do climb this beautiful mountain always regard the breathtaking panoramic views from the summit as well worth the effort; especially the rare view of the north face of Cotopaxi (arguably the best profile of this grand peak) and the headwaters of the Amazon basin below. Antisana is a Quichua word meaning “Man of Wind and Snow”, named after the fact that all four of its peaks are covered by beautiful blue tinted glaciers. These large and active glaciers atop Antisana are the deepest of any found on Ecuador’s tallest peaks, in fact they provide the most massive and deepest coverage of equatorial snow and ice in the world! 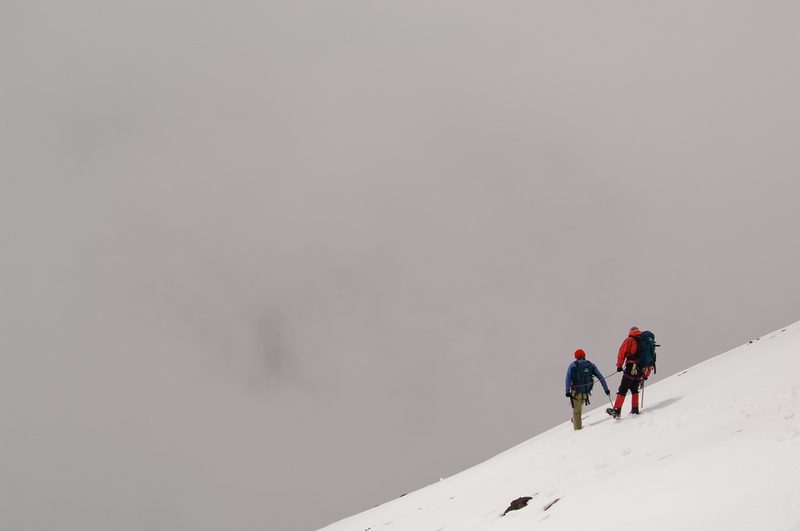 The prevalence of ice walls, crevasses and technical slopes make Antisana one of the most exciting and challenging climbs in Ecuador, and an ideal climb for explorers interested in practicing crevasse travel and perfecting their snow and ice techniques. A massive prehistoric explosion changed the profile of Antisana to the shape that we see today, all but the west side of the crater was blown out in this historic eruption. The remaining huge caldera measures 5,900 ft (1,800 m) across and 3,300 ft (1,000 m) deep, and is filled with glacial snow and ice year round. It has been dormant for many years, with the most recent eruptions dating back to 1760 and 1776. These were not explosive crater-collapsing eruptions; instead they were lava flows leaking out of fissures on the side of the volcano. The 10 km long lava flow in 1760 occurred on the west side of the mountain, near Hacienda Pinantura. The 1776 flow was smaller, leaving a 6 km long lava stream near Laguna Papallacta, on the north side. Our trip takes us through the access town of Píntag, a quaint hamlet characterized by its cobbled streets and tiled roofs. We continue on to the western side of Antisana, where we will set up our base camp at an altitude of 4,533 m (14,870 ft). The next day we will begin our ascent of the mountain, as we approach an altitude of 4,600 meters the vegetation becomes sparse and marks the beginning of the technical and glaciated portion of our climb. Here we will utilize a full range of snow and ice climbing techniques on the moderately angled snow slopes interspersed with steep sections of ice. After the climb, there is an optional day extension to explore the rich diversity found throughout the Antisana Ecological Reserve as we head to the famous Papallacta thermal springs. Here we can reward ourselves after a hard climb, taking advantage of their exceptional massage and aromatherapy services. The Antisana Ecological Reserve was created in 1993, with the goal of preserving the unique native flora and fauna of the Andean páramo. It is located at the foothills of the dormant volcano, and extends into the edge of the Amazon prairie. The rolling grasslands and glacier fed streams and lakes support herds of wild horses, wolves, llamas, mountain tapir, spectacled bear and many birds, including more than 10 species of hummingbirds. The native flora consists of shrubs, orchids, mosses and other plants specially adapted to the environment. We will hike through well preserved stretches of páramo, through the cloud forest and across lava and mudflows. There is a good chance of seeing the Andean condor soaring overhead; as it has been reported that fifty percent of Ecuador’s population of these rare birds inhabit Antisana’s ecological reserve. Then we will rest and relax in the many thermal pools at Papallacta. The same volcanic activity that shaped Antisana and the other popular mountains in Ecuador, also created a very powerful heating system for natural springs in the area. Papallacta has over a dozen different natural rock pools, all at different temperatures. Drive from Quito towards Antisana. After 2 hours we will reach base camp at (4,533 m/14,870 ft ), on the western side of the mountain. Here we will prepare our equipment, then conduct a safety and skills review. Afterwards we will turn in early to rest for the next day’s climb. We wake up early for breakfast and then begin our early morning ascent up Antisana. It will take approximately 8 hours to reach the top. At the summit we will enjoy the views and prepare for the 4 hour descent back to base camp. Explore the diverse landscapes and wildlife at the Antisana Ecological Reserve. Then end the day at the infamous Papallacta thermal springs, where you can recuperate with their exceptional massage and aromatherapy. Want something even more challenging? On request, we can arrange a trip up the more demanding and technical climbing routes, such as the south, east or northeastern peaks of Antisana.